Alexandra Tsirkel came to the United States in 2008 and has since immersed herself in the American academic system. One of her goals is to combine and enrich the American system of musical education with the best traditions of the Russian school of piano playing. Her academic training includes over twelve years of study at Music School and Conservatory settings in Russia, as well as degrees from the Novosibirsk Sate Conservatoire and Masters studies at the University of Washington School of Music. 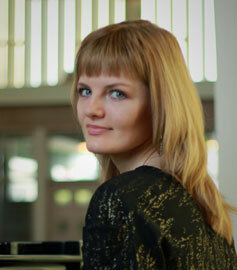 In Novosibirsk State Conservatoire Ms. Tsirkel studied with renowned pianist, Larisa Smeshko. Alexandra had the privilege of working with some of the best teachers of both Moscow and Saint-Petersburg Conservatoires, participating in several prestigious festivals and master classes. Ms. Tsirkel recently completed her studies with celebrated American pianist, Dr. Robin McCabe, at the UW School of Music, where she was a scholarship recipient and as a Graduate Assistant of the Keyboard Division for two years. Ms. Tsirkel actively performs as a soloist, as well as the accompanist for talented vocalists and instrumentalists in the United States. But her biggest passion is teaching piano. One of her main goals is providing the highest quality of musical training, as well as discovering the personal meaning of music for each and every student. With a deep sense of responsibility as a teacher, Alexandra strives to ensure that every child gets the opportunity to experience the highest level of piano training in a warm and caring manner. Alexandra’s students enjoy being recognized as prize-winners of many local and international competitions. Every year, from 2014, students of Ms. Tsirkel are invited to play in Carnegie Hall (NYC), as top-winners of Crescendo International Competition. Students of Ms. Tsirkel frequently participate in summer program of Seattle Piano Institute (University of Washington), as well as accomplish their goals through ABRSM Exam programs. Ms. Tsirkel is frequently invited by University of Washington, School of Music, as a guest-speaker, where she shares with future music teachers her personal keys to successful teaching. In April of 2016 Ms. Tsirkel co-created and presented a seminar: “Creating Success and Value through Music” with the purpose of spreading among students, parents and teachers the unique role and transforming power of music education.